This website explores the Dutch startup ecosystem through the eyes of almost 600 Dutch startups, based on their Twitter data. The concept 'ecosystem' draws on a biological metaphor explaining the entrepreneurial scene -or climate- as a finite system of interdependent heterogeneous actors tied together through various relations (now, hang in there). The startup ecosystem presented on this website is an effort to map actors that are important to Dutch startups, including incubators, accelerators, news media, specialized platforms, b2b services, other startups, co-working spaces, research institutes et cetera. These network graphs can be used to explore, to map and to position. The results shown below are part of the findings of my research master thesis at the UvA, the full paper can be accessed here. 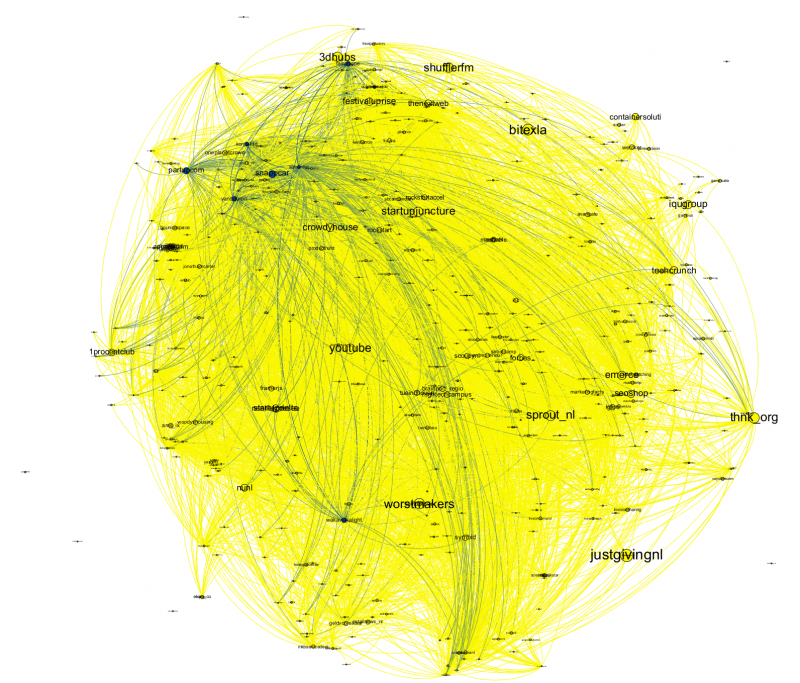 What would happen if one would use the Twitter data of almost 600 Dutch startups to map their interaction into one large network? Look through the eyes of Dutch startups to the local ecosystem, and see which parties are important to them. How to read such a network? Where are they positioned in the network above? What can be said about the position and integration of the nine social startups? Together with these social startups, another 5 organisations have been interviewed for their role seems important to integrate the sharing economy / sustainable entrepreneur cluster, being: Pakhuis de Zwijger, Sprout, Share NL, Social Enterprise NL and Impact Hub Amsterdam. Last but not least, a general cluster-based analysis allows to find the various clusters distinguished in the Dutch Startup Ecosystem. 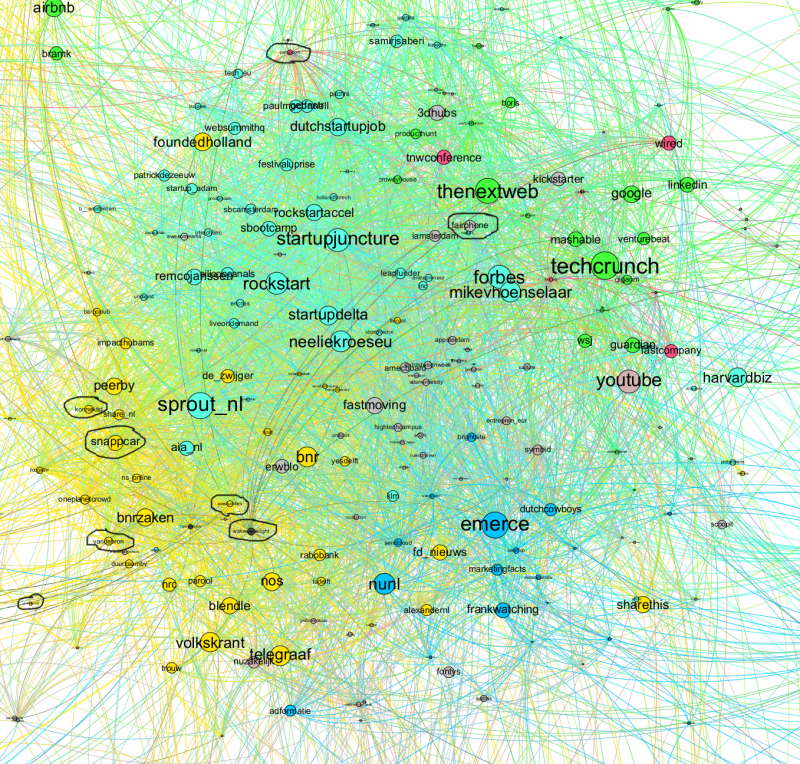 Simply looking into the actors involved in such clusters (together with interview data – see below), indicates some themes around which the clusters organize themselves. A zoomable map of this analysis can be downloaded here. But why these interviews? Talking to people on ground level is crucial to understand the mechanisms at work under the surface of these graphs. Interviews helped to explain, nuance and complicate the findings in the network while creating sensitivity to the limitations of Twitter-driven analysis too. See what implications these interviews lead to in my recent blog post ‘the politics of network graphs‘. Some of the limitations can be found in the presentation I did at the Entrepreneurship Future conference. 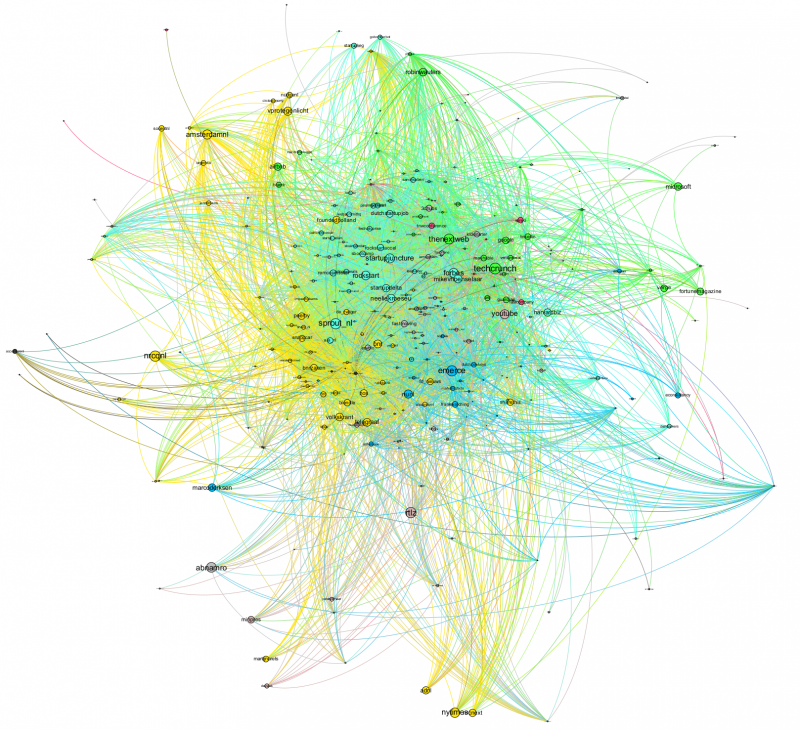 Throughout the use of earlier notions of an entrepreneurial ecosystem which derived from economic cluster analyses and system thinking, network theory has always been one of the explananda to understand an ecosystem. Drawing on the widely used biological metaphor, I operationalized an ecosystem as a heterogeneous set of interdependent actors. In my research I try to step away from the expert as the starting point, instead, I re-appropriate (non-evoked) Twitter data produced by Dutch entrepreneurs. In other words: I used the online Twitter activity of 598 Dutch startup entrepreneurs to map their affiliation network based on who they interact with (@mention). The sample of entrepreneurs was informed by the entrepreneur’s database Dealroom, a combination of user-generated and aggregated information on startup enterprises. I bypassed the discussion on what would qualify a startup, by using their database only as an entry point into the field. In order to get to an interpretation of what the network represents, I ask various entrepreneurs that were included in the graph to interpret the graph, their position, and their surroundings. This is the step from an exploratory descriptive network to a more explanatory interpretation which I would argue is what makes it a valid entrepreneurial ecosystem approach. These collaborative readings allowed me to know the limitations of a Twitter-driven network, and the implications of representing an ecosystem as a network (rather than a diagram). * Stam, E. (2014). 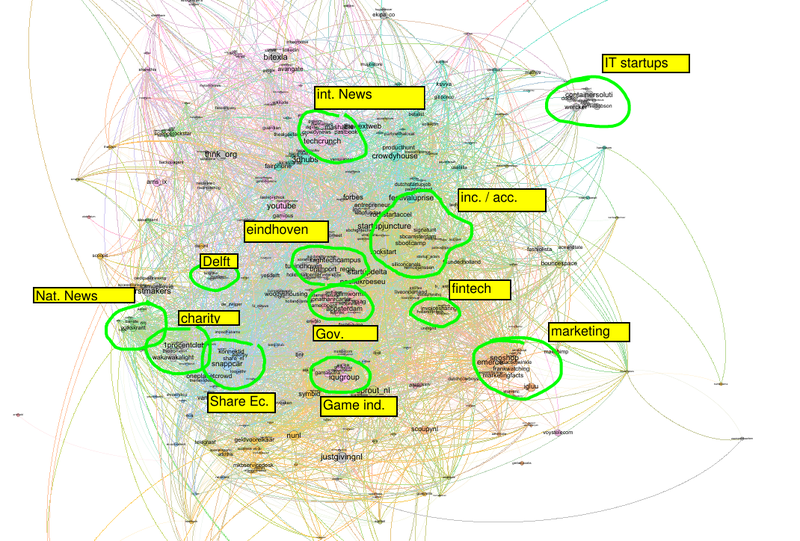 The Dutch entrepreneurial ecosystem. Available at SSRN 2473475. This project has been established with the help of Dealroom and in a collaboration with Digital Methods Initiative [UvA]. 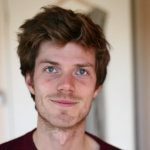 Interdisciplinary researcher: New Media, Anthropology, Urban Studies and collaborative research. Keen on exploring the upsides and pitfalls of combining data analysis practices with ethnographic tradition. Where data analysis has a strong exploratory potential, bottom-up interviews help to explain, validate and scope the analysis. At home in messy data, scraping social media, social network analysis on the one hand and qualitative research, hypothesis making and interview techniques on the other. Copyright © 2019 The Dutch Startup Ecosystem:. All Rights Reserved.